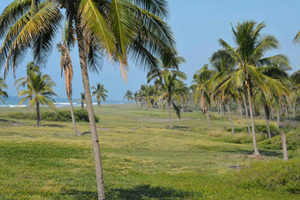 The Resort Community will be built on 25 hectares (62 acres) of beautiful palm tree plantation property at Tecuanillo, Mexico in the State of Colima. Colima is on Mexico’s Pacific coast immediately south of the State of Jalisco where both Puerto Vallarta and Guadalajara are located. Colima is located at the same latitude as the Hawaiian Islands. The Concierto property is adjacent to 240 hectares (600 acres) of palm tree plantation lands ideal for projects complimentary to the residential community such as a golf facility, theme park, shopping centre, hotel and conference centre, health care facility and more. The property has the luxury of 2 km of fine black, volcanic sand beach to roam to your heart’s desire. The resort has the best of both worlds, with prestigious secluded gated community life and minutes away from the hustle and bustle of essential services, excellent health care, shopping and recreational activities. Concierto Resorts Community is 10 kilometers from the bustling city of Tecoman, 50 km from the Capital City Colima, 77 km from the large port city and tourist center of Manzanillo and 105 km from the International Airport. The Government plans to relocate the International Airport to a location 35 km from Concierto. A well maintained four-lane paved highway leads directly from the airport for 97 km when it joins a two-lane paved secondary highway for an additional 10 km to right to the Property. Several other major airlines also service the growing demand for the State of Colima as a vacation and retirement option. Of course when folks are seeking vacation destinations or something more permanent like a second or retirement home, price is always a primary factor. Concierto Resorts will challenge all Mexican resort communities for great value while maintaining excellence in design, materials and workmanship with a wide variety of condo apartment sizes and price points for every potential neighbor. The community is a staged project, the first of which has three phases, each of two 8 story buildings of Mexican design with distinctive Canadian touches. Phase 1 offers a range of apartment sizes including 1044 ft2, 1290 ft2, 1488ft2, 1686 ft2 and 1890 ft2. Subsequent phases in the 1st Stage will offer these sizes as well as 3020 ft2 8th floor penthouses. Covered parking is included as is a high quality seven appliance package. 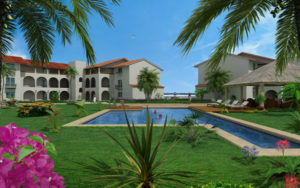 The resort community will feature a full-service Clubhouse offering a Wellness Center with spa services, a restaurant and lounge, yoga studio with internationally trained staff, an expansive infinity pool, fitness facility, convenience store, shower facilities, offices for client services and property management and the Concierto Ocean Front Resorts Sales Centre. All Concierto residences will be priced in Canadian funds for the express purpose of never being tied to ever fluctuating US dollar. This alone provides clients the world over with amazing financial gains. Life in Paradise should not be out of reach and Concierto Resorts is doing their part to make that a reality!